Taipei or Peking - Tough Decision for U.S. This is Golgotha, the Place of the Skull, upon which Jesus Christ, the Savior of the world, was crucified. The natural caves in this small hill outside the walls of Jerusalem give the appearance of eyes, and, below the rock wall recently built by the Arabs, another set of gaping holes representing nose and mouth — hence the name of the hill. 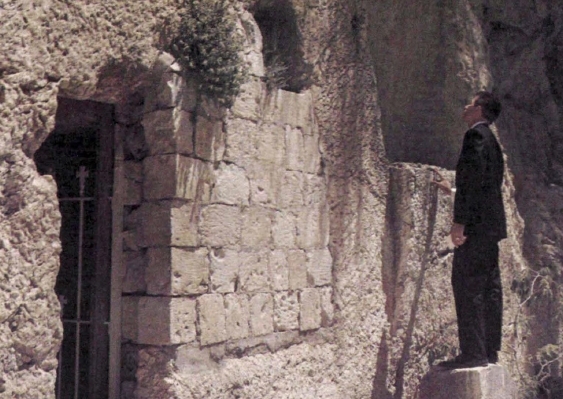 Immediately to the left is the Garden Tomb, which once belonged to Joseph of Arimathea, where Jesus was buried. Easter Sunday does NOT commemorate the resurrection! Christ did NOT die on "Good Friday"! Read here the astounding, irrefutable PROOF that the true date of the crucifixion and the resurrection can be known! EITHER the "Good Friday, Easter Sunday" tradition is a fable — or you have NO Savior! Jesus gave only one sign to prove that He was the Messiah! And that sign was the length of time He would be dead and buried. "An evil and adulterous generation seeketh after a sign; and there shall no sign be given to it, but the sign of the prophet Jonas: FOR AS JONAS WAS THREE DAYS AND THREE NIGHTS IN THE [FISH'S] BELLY; SO SHALL THE SON OF MAN BE THREE DAYS AND THREE NIGHTS IN THE HEART OF THE EARTH" (Mat. 12:39-40). If He did not fulfill that sign, then He was an impostor and you are without a Savior! Of course theologians and scholars deny that Jesus fulfilled this sign. They say He was in the heart of the earth only one day and two nights — half as long as He thought He would be! And in so doing they deny the ONLY PROOF Jesus gave that He is the Messiah, the Savior of the world. Did you know that it was prophesied that people would deny this sign — would deny that Jesus actually is the very Christ? Turn to the Scripture: "But there were false prophets also among the people [in Old Testament times], even as there shall be false teachers among you [Christians], who privily shall bring in damnable heresies, even denying the Lord that bought them...and MANY shall follow their pernicious ways" (II Peter 2:1-2). The MANY are today denying their Savior by believing a tradition that rejects the only sign Jesus gave to prove He is the Messiah! Did you how that it was not until after the death of the last of the twelve apostles — John — that the "Good Friday — Easter Sunday" tradition began to spread through the churches? Let's examine Jesus' own words, recorded in the gospels, to find out if He meant what He said about the sign of Jonas. Did Jesus really expect to be buried in the earth for three days and three nights? Notice Mark 8:31: "And He began to teach them, that the Son of man must suffer many things, and be rejected of the elders, and of the chief priests and scribes, and be killed, and AFTER THREE DAYS rise again." Did you grasp that? Jesus did not say "after a day and a half." Jesus said, "after three days." Consider! If Jesus were crucified and buried late on "Good Friday," then one day after would be Saturday evening, and two days after would be Sunday evening, and three days after would be Monday evening. But Jesus rose long before Monday evening. Either Jesus was not crucified on "Good Friday," or He did not fulfill His sign and He is therefore an impostor and not the Messiah! Did Jesus fulfill His sign? Turn to Matthew 28:6. Here is the testimony of the angel: "He [Jesus] is not here: for He is risen AS HE SAID"! Jesus did fulfill His sign, exactly as He said He would. He IS the Savior. Then He could not have been crucified on "Good Friday"! But this is not all. Turn to John 2:19,21: "Jesus answered and said unto them, Destroy this temple, and in three days I will raise it up.... But He spake of the temple of His body." If Jesus would have been crucified and buried on Friday evening and been resurrected on Sunday morning, the temple — His body — would have been raised in a day and one-half. But Jesus did not say it would occur in a day and one-half. Not even in In other words, in exactly three days and three nights, at the precise moment, three 24-hour days after his death and burial. Isn't it plain that Jesus meant exactly what He said? — three days and three nights, not parts of three days. But Jesus also declared He would rise "the third day." Let us suppose again that Jesus was crucified on Friday. If He were to rise on the first day after His crucifixion and burial, He would be raised on Saturday; if on the second day after his crucifixion, He would rise on Sunday; but if He were to rise on the third day, He would have been raised on Monday! But Jesus was already resurrected by Sunday morning. Plainly, Friday was not the day of the crucifixion! How clear that all these expressions mean the same thing — three days and three nights — 72 hours! Jesus never once said He would be parts of three days in the grave. Adam Clarke, in his commentary on Matthew 12:40, quotes the Jewish Talmud in support of the idea that three days and three nights supposedly mean one day and two nights! The Seventh Day Adventist Bible Commentary implies the same. But the Bible is not interpreted by the Jewish Talmud or by a human Commentary. Jesus rejected the Talmudic traditions of the Jews. In the April 1956 issues of the Review and Herald, the official publication of the Seventh Day Adventists, appeared two articles on the crucifixion listing several texts which, they claim, indicate that three days means no more than a day and one-half! Let's look at these verses to see if the Scripture supports what they claim. Here is the first text they offer as "proof" that "after three days" does not mean after three days! Notice it! King Rehoboam told the people who came to meet him: "Come again unto me after three days. And the people departed" (II Chronicles 10:5). The same event is quoted in I Kings 12:5, "Depart yet for three days, then come again unto me." The story continues with verse 12: "So Jeroboam and all the people came to Rehoboam the third day, as the king had appointed, saying, Come to me again the third day." The people left "for three days" and did not return until "after three days" — "as the king had appointed." Let us suppose they had first met the king sometime on Friday. As they were ordered to return at the end of three days, they could not have returned before the same time of day the following Monday. Now was Monday "the third day" from the day they had originally met with the King? The first day from that Friday was Saturday; the second day from that Friday was Sunday; and the third day was Monday — exactly the time the king expected them to return. Notice how the Bible counts from one period of time to another. Turn to Nehemiah 5:14: "... I was appointed to be their governor in the land of Judah, from the twentieth year even unto the two and thirtieth year of Artaxerxes the king, that is TWELVE YEARS..." Notice that from the 20th year to the 32nd year is TWELVE YEARS, not thirteen years. Similarly, the third day from a Friday is a Monday, not a Sunday. The next text the Adventist Commentary offers as "proof" that "three days and three nights" means only one day and two nights is in Esther 4:16 and 5:1. "Fast ye for me," said Queen Esther, "and neither eat nor drink three days, night or day: I also...will fast likewise; and so will I go unto the king." "Now it came to pass on the third day, that Esther put on her royal apparel'' and went to the king. Which day was this? — the third day of the fast. Suppose Queen Esther had requested the Jews late Friday evening, shortly before sunset, to fast. The first day of their fast would have been Saturday; the second day would have been Sunday; and on the third day — Monday — the Queen would have entered the king's palace. Isn't that plain and simple? The Jews did not fast parts of three days, but three days, night and day! Notice that in each of these examples, three days means three days, not parts of three days or only a day and one-half. There is no exception! After three days does not mean after one and a half days. It means after three days! Jesus was buried shortly before sunset on the day of the crucifixion (Luke 23:54). Since Jesus said that He would "rise the third day" after the day of His crucifixion, it is obvious that the resurrection must have occurred precisely at the completion of the third day following his burial. Then the resurrection must have occurred near sunset three days later. When the women came to the tomb, early Sunday morning, Jesus had already risen. The angel said, "He is risen: He is not here" (Mark 16:6). Therefore Jesus could not have risen later than near sunset Saturday afternoon three days after His burial — because He was not at the sepulchre Sunday morning. Three days before Saturday would place the crucifixion on Wednesday, the preparation day for the Feast of Unleavened Bread. Thursday of that year must have been an annual Sabbath, the first annual Sabbath in the Days of Unleavened Bread. So that we would know that that Sabbath which followed the crucifixion was not necessarily the weekly Sabbath, John was inspired to call it a "high day" (John 19:31), which, according to Jewish usage, means an annual Sabbath which may occur any day during the week! Mark picks up John's account by adding that AFTER THAT SABBATH, which was a high day, the first day of the Feast of Unleavened Bread, the women bought sweet spices to use in anointing the body of Jesus (Mark 16:1). This purchasing of the spices could not have been on Thursday, the annual Sabbath: it must have been Friday! Having made their purchases, the women prepared these ointments "and rested the Sabbath day according to the commandment" (Luke 23:56). This was the seventh-day Sabbath upon which, near its close, Jesus was raised from the dead. 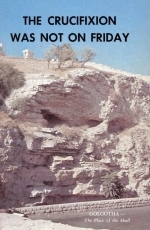 Thus the Bible proves that the resurrection was not on Sunday, the crucifixion not on Friday. THERE WERE TWO SEPARATE SABBATHS THAT WEEK! — one, an annual Sabbath, the other, a weekly Sabbath. Turn to Matthew 28:1. In the common versions it says, "In the end" — or more correctly, "After the Sabbath." 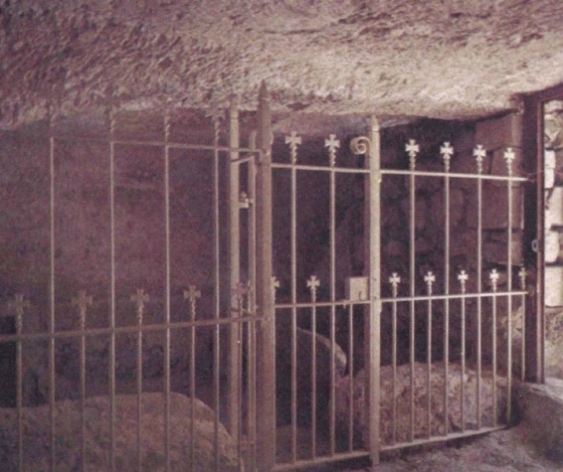 Interior and exterior views of the Garden Tomb in which Jesus Christ was buried and from which He arose after being three days and three nights in this grave. No remains of the huge stone door which once sealed the tomb now exist. At right of entrance to Garden tomb is Garner Ted Armstrong, speaker on The World Tomorrow broadcast. Nearby, to the right, is Golgotha - the Place of the Skull - where Jesus was crucified. Read in this booklet the astounding truth that Christ's resurrection was not on Sunday - and that the crucifixion was not on Friday! Notice that both of these renderings use the singular — Sabbath. But in the original Greek the word is in the PLURAL. Fenton renders it correctly by saying, "After the Sabbaths." In a footnote to this text, he says, "The Greek original is in the plural. 'Sabbaths' " — which all the scholars should know! Another verse causing the Bible apparently to contradict itself is found in Mark 16:P. Open your Bible to this verse. This verse does not prove the resurrection was on Sunday. In the common versions, the comma. is placed following the word "week," making it appear that Jesus arose on Sunday morning. But the use of commas in the Bible did not develop until about fourteen centuries after this was written. In the original Greek the phrase "early the first day of the week" can be grammatically connected either with the words "having risen" or with the words "He appeared first to Mary Magdalene." The Expositor's Greek Testament says the phrase "early the first day of the week" may be either "connected with [having risen], indicating the time of the resurrection, or with [appeared], indicating the time of the first appearance." The Scriptures elsewhere prove it could not refer to the time of the resurrection. As it could refer to the first appearance of Jesus to Mary (John 20:14), Mark 16:9 should. have been translated, "NOW having risen, early the first day of the week he appeared first to Mary Magdalene." The Montgomery translation renders this verse correctly. The translation of this verse in the Revised Standard Version is absolutely incorrect. These same men attempted to CHANGE the year of Jesus' birth; they attempted to CHANGE the year that He began His ministry; they attempted to CHANGE the length of His ministry; they attempted to CHANGE the day of His death, and they attempted to CHANGE the day of His resurrection — all to justify a pagan tradition of the Sunday resurrection of Nimrod, the pagan savior! One of the first attempts to change the day of the resurrection from late Saturday to the early hours of Sunday occurred in the spurious "Gospel of Peter," probably circulated from Rome about the time of the death of the apostle John. This "gospel" reads as follows: "...And they drew out the nails from the hands of the Lord, and laid Him upon the earth... And the Jews rejoiced, and gave His body to Joseph that he might bury it....And he took the Lord, and washed Him, and rolled. Him in a linen cloth, and brought Him into His own tomb....And I and my companions were grieved; and being wounded in mind we hid ourselves....And upon all these things we fasted and sat mourning NIGHT AND DAY UNTIL THE SABBATH. "But the scribes and Pharisees and elders being gathered together one with another...came to Pilate, beseeching him and saying, Give us soldiers, that we may guard His sepulchre for three days, lest His disciples come and steal Him away....And with them came elders and scribes to the sepulchre, and having rolled a great stone together with the centurion and the soldiers, they all together set it at the door of the sepulchre; and they affixed seven seals...and guarded it. And early in the morning as the sabbath was [dawning], there came a multitude from Jerusalem and the region round about, that they might see the sepulchre that was sealed. Notice! Between the crucifixion and the Sabbath, the disciples and Peter are said to have fasted "night and day until the Sabbath." This alone is a candid admission that the crucifixion was not on "Good Friday"! It was decades later before the idea of a Friday crucifixion and a Sunday morning resurrection was widely believed. The apostle Paul called Jesus Christ our Passover (I Corinthians 5:7). According to the gospel records, Jesus was crucified on the Passover day — Abib (or Nisan) 14 — immediately before the Feast of Unleavened Bread. Jesus ate the Passover — which was also a day on which no leavened bread was used — (Luke 22:8) on the eve of the 14th of Abib, shortly after sunset. This was the precise time commanded for the first Passover in Exodus 12:6. (Remember that according to the Bible a day begins at sunset, not at midnight.) But the Jews, following their own traditions, killed their lambs late on the afternoon of the 14th and ate them the next night (John 18:28). In either case the Jews and Jesus and the Apostles agreed as to which day it was. There was no question about the date. The only difference concerned what ought to have been done on that date. But how did the Jews know which day it was? How did Jesus and the Apostles know that this was the Passover day as God had appointed it? By GOD'S calendar, of course! The Passover was the 14th day of the first month according to the Sacred Calendar set by Jesus and the Jews. But where did this calendar come from? Was it the invention of Jewish tradition — or revealed by God to the people? Was Jesus observing the Passover according to Jewish tradition or according to the revelation of God? IF THE CALENDAR WHICH JESUS AND THE JEWS WERE USING INSPIRED CALENDAR AND IF THE JEWS WAS A DIVINELY ARE STILL USING THAT SAME CALENDAR TODAY, THEN WE CAN KNOW PRECISELY WHICH DAY THE PASSOVER WAS IN THE YEAR OF THE CRUCIFIXION! Is the Calendar of the Jews Divinely Inspired? We are told that the "Jewish Calendar" is an invention of the Jews — that it is different today from the one which the Jews and Jesus used. We are further told that the Jews at first determined the months solely by observation of the new moons and that they determined the year by observing the clouds which ended the rainy season and which allowed the spring harvest to begin. But is this true? Is observation the basis of GOD'S Calendar? Will every individual be able to observe the faint crest of the new moon at the same time? Do people always agree upon what they see? And what if the day were cloudy and no one can see the new moon — what then? And how would the Jews know which day should be the first of the month — the day when the new moon occurred, or the day when they first saw the new moon? Did God give the Jews permission to create their own calendar; or did He, instead, reveal to Israel His very own Sacred Calendar and require them to preserve it through all generations? Notice the answer in Scripture! Consider Nehemiah 8:9. The Feast of Trumpets — the first day of the seventh month — "this day is HOLY unto the Lord your God." Do you grasp it? It is God who made the day holy. No man can make anything holy. The 10th verse repeats again that that day is holy to God. Since that day is holy to God, then God must determine which day it is. The very fact that this annual Festival is HOLY TO GOD s proof that man is not free for himself to determine which day it is. The only way for the Jews to have known that the seventh annual new moon is holy is by having been given a calendar which reveals which day it is! If the Jews were left solely to observation, and the day were cloudy or the atmosphere were not clear, they certainly would not have been able to know which day was holy to God. OBVIOUSLY THE Jews WERE NOT LEFT TO OBSERVATION! God MUST HAVE REVEALED TO THEM HOW TO CALCULATE HIS DIVINE CALENDAR! Notice the proof of Scripture: "And the Lord spake unto Moses, saying, Speak unto the children of Israel, and say unto them, Concerning the feasts of the Lord, which ye shall proclaim to be holy convocations, even these are My feasts" (Lev. 23:2). The Israelites are required to proclaim a convocation — a commanded meeting for the people — on the days of God's choice, but God determined which days are His feasts. And now notice Exodus 23:15: "Thou shalt keep the feast of unleavened bread: (thou shalt eat unleavened bread seven days, AS I COMMANDED THEE, IN THE TIME APPOINTED OF THE MONTH ABIB... and none shall appear before Me empty)." Notice that the particular days of the Festival are appointed by God. God commanded the Israelites when to celebrate His Festival. Men must appear before Him. Unless God had revealed His own inspired calendar, the Jews could never have known by observation alone when to appear before God and which days were holy. And notice further, Psalm 81:3-5: "Blow up the trumpet in the new moon, in the time appointed, on our solemn feast day, for this was a statute for Israel, and a law of the God of Jacob." God, not man, determines the times and the seasons (Dan. 2:21). It is the Jews to whom God committed His revelations or oracles. Paul declared: "What advantage then hath the Jew?...chiefly, because that unto them were committed the oracles of God" (Romans 3:1-2). The oracles of God included the Old Testament Scriptures, the knowledge of the week and the knowledge of the Sacred Calendar. The Jew preserved for the world the knowledge of which day the seventh day of the week is. Without a knowledge of when a week begins and ends we could never have told from the Bible alone which day the seventh day actually is. No nation preserved the week properly until they learned it from the Jews! That is the record of history. And in the same way only the Jews have preserved God's calendar. "But," you ask, "what if some Jews did not believe in the oracles of God — including the Sacred Calendar — which were committed to them? Did they lose them or corrupt them?" The Bible gives us the answer plainly in Romans 3:3-4: "For what if some did not believe? shall their unbelief make the faith of God without effect? God forbid: yea, let God be true, but every man a liar." If the Jews did not believe in what God committed to them, even if they lie about God's truth, THEY MUST PRESERVE THEM or God has failed to be God! Notice: "The secret things belong unto the Lord our God: but those things which are revealed belong unto us and to our children FOREVER" (Deut. 29 :29). The Jews have had to preserve these things. God purposed it! Now consider what God says of those Jews who decided not to follow the calendar God gave them and decided, instead, to observe their own new moons for themselves. Did God say that was permissible? Was that all right with Him? Turn to God's answer in Isaiah 1:14: "YOUR new moons and YOUR appointed feasts My soul hateth..." The same condemnation is voiced in Hosea 2:11 against the House of Israel. But do we find specific laws in the Bible which forbid the Jews to determine for themselves when the year begins? Indeed we do: "There shall not be found among you... an OBSERVER OF TIMES..." (Deut. 18:10). The same command is repeated in Leviticus 19:26: "Ye shall not eat any thing with the blood... nor OBSERVE TIMES." Why? "For these nations, which thou shalt possess, hearken unto observers of times, and unto diviners: but as for thee, the Lord thy God hath not suffered thee so to do" (Deut. 18:14). The words "observer of times" are translated from anan — meaning "cloud" — in the original Hebrew. An observer of times is one who "watched the clouds" in order to determine when the winter rainy season was over and when the spring harvest season would begin. He was one who set himself up in place of God to determine when the year should begin in the spring. But God forbids any such thing. Notice from Galatians 4:10 that Paul forbids the observance of "times" or "months" and holidays which the Gentile converts had been accustomed to celebrate. Here is a surprising NEW TESTAMENT command not to follow the months of the pagan Roman calendar then in use, but rather to follow the months as God gave them. Because this command was not followed by the professing Christian world, the Roman calendar is still in use today. How plain that God has required the Jews to preserve His sacred calendar! Even the great Jewish calendar expert Maimonedes, who lived nearly 1000 years ago, declared that the Jews preserved the calendar "transmitted by the Sages from one generation to another on the authority of Moses, our Teacher...on the basis of calculation" (from Sanctification of the New Moon, chapter 18, 57). Now that we have determined that the calendar which Jesus and the Jews used was divinely inspired of God and committed to the Jews for transmission through all generations, then there are only two things left in order to prove when the crucifixion and the resurrection of Jesus Christ occurred. One is to determine the calendar dates of the Passover during the years of Christ's ministry. The other is to determine the exact year of the crucifixion. Now for the seven historical and calendrical proofs that the "Good Friday-Easter Sunday" tradition is a fable which denies Jesus to be the Savior. To place the Passover on a Friday in 30 A.D. is to violate one of the inspired rules of the calendar — that no common year of the sacred calendar may have 356 days. Common years of twelve months may be only 353, 354 or 355 days long — a fact you can verify in the Jewish Encyclopedia. Theologians place the Passover of 30 A.D. on Friday, April 7 — 356 days after the Passover of 29 A.D. Count it for yourself! This date is two days late. The Passover in 30 A.D. was only 354 days after that of 29 A.D. These scholars forget that God had His sacred calendar, together with the Bible, preserved since the days of Moses to this very day — and that every date of the Passover may be infallibly determined! Moreover, astronomers recognize that the 14th of the month Nisan could have occurred on Wednesday in 30 A.D., as well as in 31 A.D. — but the theologians will not receive their testimony because of their human traditions. Thus, if you want to believe that the crucifixion was in 30 A.D. — which it was NOT — you would still have to admit that Friday is NOT the day of the crucifixion! For the year 31 A.D. several references, unacquainted with God's calendar, mistakenly give the Passover, Nisan 14, as Monday, March 26. But this is one month too early. The year 30 — 31 A.D. was intercalary — that is, it had 13 months — thus placing the Passover thirty days later in 31 A.D., and on a Wednesday! During the time of Christ and up to 142 A.D., according to the rules of the Sacred Calendar, the Passover could not occur earlier than six days after the vernal equinox — which in that year occurred on March 23, about 3 a.m. Greenwich time. Remember, in Jesus' day the equinox did not occur on March 21, but on March 22 or 23, because the Roman world was using the Julian calendar. Since March 26 was only three days after the equinox, it could not have been the Passover. Hence in 31 A.D. the Passover was 30 days later on a Wednesday — and this is the ONLY POSSIBLE YEAR in which Christ could have been crucified, as we shall now PROVE. There are several basic dates from which the exact year of Christ's death may be determined. These dates are so precise that there can be no doubt that the Passover upon which Jesus was crucified occurred on Wednesday, April 25, A.D. 31.
would be "cut off" — crucified — "not for himself" but for the sins of the whole world. Sixty-nine prophetic weeks equals 483 years (69 X 7). When we determine the year in which this decree was issued, we can locate the exact year, 483 years later, when Christ — the Messiah — began His ministry. In recent years an abundance of documents from the era of Ezra and Nehemiah — business records giving exact dates according to the Persian, Egyptian and Jewish calendars, and astronomical tablets recording eclipse cycles in the years of kings — have been translated. These records continue fundamentally to corroborate the chronological table of Persian kings recorded in Ptolemy's canon. Records, preserved in world-famous American and foreign libraries, have been found that were written in the very month that Artaxerxes — under whose reign the decree was issued — came to power. The death of Xerxes occurred in late December, 465 B.C., and his son, Artaxerxes, came to the throne in that month. According 'to the Persian spring-to-spring reckoning of regnal years — as these business documents clearly show — Artaxerxes' first year extended from April, 464 to April, 463 B.C. These same business documents show that the Jewish autumn-to-autumn mode of reckoning, used by Ezra and Nehemiah, placed the first year of Artaxerxes from September 464 to September 463 B.C. The period of time from the day the new king ascended the throne to the first year of his reign was called his ACCESSION YEAR and was regarded as completing the last regnal year of the previous king. The astronomical tablets containing over a dozen precise records of eclipses prove that the first year of Artaxerxes, according to the Jewish reckoning, was from 464 to 463 B.C. You may verify these facts in any of the latest thorough books on archaeology. The seventh year of Artaxerxes — the year in which he issued his decree (Ezra 7:8) — would extend from about September 458 B.C. to September 457 B.C. From the first month to the fifth month of God's calendar — from the latter part of March to the latter part of July, 457 B.C. — Ezra journeyed to Judaea in the seventh year of Artaxerxes at which time the decree went forth to build Jerusalem as the capital of the revised Jewish nation. And just 483 years later would bring us to the autumn of A.D. 27 — the year when the Messiah would appear. Although the date of the issuance of this decree is amply proved from astronomy, dozens of business documents, and the Canon of Ptolemy, historians sometimes misinterpret the facts to suit their pet theories. Then theologians quote from whatever historical sources suit them in order to change the true date for the beginning of Christ's ministry. But the true date — 457 B.C. — is absolutely fixed by the most accurate records of history written at that very time. Some religious sects would incorrectly put this decree as late as 455 B.C. in order to have the crucifixion occur on Friday in 33 A.D.! Such a date is totally rejected by ALL historians today! Jesus, according to Daniel's prophecy, was anointed the Messiah in 27 A.D., which was 483 years after the decree of Artaxerxes to restore Jerusalem. The next fact that we need to understand is the age of Jesus when He was baptized and entered upon His ministry. The only historical account of this was written by Luke to Theophilus (Luke 1:1-4). In this account it is plainly stated that when Jesus began His ministry "he was about thirty years old" (Luke 3:23). Luke did not say, ('about 29," or "about 31." He records that Jesus "began to be about thirty" — and he meant it, for he was an inspired historian. Either this record is true or you might as well discard the Bible. As Jesus was about 30 years old in the autumn of 27 A.D., then He must have been born in the autumn of 4 B.C. The proof of this in history is found in the Chronicle of John Malalas, translated by Matthew Spinka (Univ. of Chicago Press, 1940). John Malalas was a historian of Antioch, Syria (c. 491-578 A.D.). On pages 32-33 he writes: "In the 39th year and the 10th month of his [Augustus'] reign he commanded the taking of a census of all his lands, including all that the Romans held during the consulship of Agrippa 11, and of Donatus. And all the earth under the Romans was registered by Eumenes and Attalus, the Roman senators.'' Using the October-to-October calendar Malalas used, that dates the 39th year as October, 6 B.C., to October, 5 B.C., and the issuance of the decree for the census to July, 5 B.C. Suidas — another reliable authority — and many others, add information about Augustus' decree, which proves the census in Palestine was conducted the very next year — 4 B.C., the very time Christ was born! Abundant evidence from both early Christians and early pagans corroborate this census (see the excellent article in Unger's Bible Dictionary under "Chronology"). The time of Jesus' birth is important. Jesus was born before the death of Herod the king (Mat. 2:15). When did Herod die? Again the critics are in utmost confusion because they have refused to weigh all the facts. According to Josephus, the Jewish historian, Herod died, "having reigned, since he had procured Antigonus to be slain, thirty-four years; but since he had been declared king by the Romans, thirty-seven" (Antiquities, XVII, viii, 1). The two dates for the beginning of Herod's reign are not disputed, but given as 37 B.C. and 40 B.C. respectively. Reckoning as Josephus does, the last year of Herod's reign extended from about April, 4 B.C. to April, 3 B.C. Although Herod's death is commonly dated in April, 4 B.C. — or even as late as 2 B.C. — neither of these dates is correct. Simple subtraction ought to prove that! Herod died just prior to the beginning of spring in B.C. 3! Josephus, in Antiquities of the Jews, XVII, vi, 4, mentions an eclipse of the moon before the death of Herod. That eclipse, as calculated, occurred about March 13, 4 B.C. Yet it was after this that Herod went beyond the river Jordan to be cured of his diseases. Finding that the physicians couldn't cure him, he still revived sufficiently to return to Jericho. There, he gathered together and contrived the death of the principal men of the entire Jewish nation. And as if this were not enough, Herod had his son Antipater killed five days before his own death. Since these and other events occurred after the eclipse mentioned by Josephus, and since Herod died pust prior to a Passover according to Josephus, that Passover must have been THIRTEEN MONTHS AFTER THE ECLIPSE and not one month later. Thus Herod died in B.C. 3, the only date that agrees with all the known facts of history. As Jesus was about thirty years old in the early autumn of 27 A.D., then He must have been born in the early autumn of B.C. 4, about half a year before the death of Herod. Jesus could not have been born before this time, or He would have been more than thirty years old at the beginning of His ministry. Neither could He have been born later in B.C. 2 as some assume, for He would have been only twenty-eight years old. But Luke plainly said that He was about THIRTY years of age. When Did the Wise Men Arrive? But what are we going to do with the statement recorded in Matthew 2:16 that just before his death Herod had all the children in Bethlehem killed "from two years old and under"? This would appear to indicate that Jesus may have been born one year earlier than He really was born. Most people carelessly read this account by assuming that Herod knew the date of Jesus' birth. They think he had all the children killed because Jesus must have been between one and two years old. Think for a moment how illogical this would be. Would a murderer like Herod wait for at least one whole year after the Magi left before attempting to kill the child Jesus? Of course not. The truth is that Herod did not know the time of Jesus' birth. Notice what the Scripture states: As soon as Herod saw that the Magi didn't return to him he became very angry, ordering all those little children butchered "from two years old and under, ACCORDING TO THE TIME WHICH HE HAD exactly LEARNED of the magi" (Mat. 2:16). Now what was the exact time that he learned from the magi? Was it the date of Jesus' birth? No! Notice verse seven of this same chapter: "Then Herod privily called the magi, and learned of them exactly the time of... what? The birth of Jesus? No. But "of the appearing star." The wise men or magi had come a great distance from the East and the star had appeared some time before the birth of Jesus in order for them to prepare to make their journey to Bethlehem while Jesus was still very young. Since the star appeared more than one year previously, Herod took no chances but had every infant killed up to two years of age. Jesus was slightly less than six months old at the time of Herod's death. The latest possible date for the birth of Jesus was the autumn of B.C. 4, before winter arrived (Luke 2:8). This places the commencement of the ministry of Christ, thirty years later in the autumn of the year 27. Here is another clinching fact. Jesus was about thirty years old when He began His ministry in the autumn of 27 A.D. The first Passover in His ministry must have occurred the next spring, A.D. 28. It was at that time that the Jews told Jesus that the temple of Herod was already "forty-six years in building" (John 2:20). Herod began constructing the temple, after three years' thorough preparation, in the very last part of his 18th year according to Josephus (Antiquities XV, xi, 1).Since he reckons this 18th year from the spring of B.C. 37, the 18th year would be 20-19 B.C. The temple was begun in the months immediately preceding the Passover, B.C. 19. The major part of the construction was completed by the autumn of B.C. 18 (Antiquities XV, xi, 6) in about 1 1/2years. Forty-six full years from B.C. 19 would bring us to the beginning of A.D. 28, just before the first Passover in Jesus' ministry. If the ministry of Christ began in any other year than the autumn of A.D. 27, then the temple would not have been exactly 46 years in building by the time of the Passover in the spring of 28 A.D.
One of the most vital keys to the chronology of Christ's ministry — and yet one of the most universally misunderstood dates — is the 15th year of the reign of Tiberius Caesar. Luke tells us that John the Baptist began to preach in his 15th year (Luke 3:l). When was this fifteenth year? The trouble arises from the fact that there are at least two dates from which the reign of Tiberius Caesar may be counted — the first commences with his being made co-ruler with Augustus Caesar, at the very end of A.D. 11 or the beginning of A.D. 12. The exact month is not known, but it is not essential anyway. The second date begins with his sole rule in August, A.D. 14. Luke could have used either date and been historically correct. But which one did he use? To be consistent with all the other facts, Luke must have used the earlier date as the beginning of the reign of Tiberius. In fact, for the word "reign" Luke uses a Greek word meaning "government" in general, indicating that he did not mean his sole emperorship, but merely his elevation to joint authority — about the end of A.D. 11 or beginning of A.D. 12. In determining the emperor's regnal year, Luke used the customary Jewish form, practiced also by Josephus. "Josephus also... in order to avoid making the last year of one emperor coincide with the first year of his successor, reckoned the final year of each emperor as continuing to the end of the current year, and made the first year of his successor begin [in] April following his accession," says the competent scholar W. M. Ramsey in his book Was Christ Born at Bethlehem?, page 223. This method which has but recently been understood, was used by Luke also to determine imperial joint reigns. The first year of the joint reign of Tiberius would extend from about April, 12 A.D. to April, 13 A.D. His fifteenth year would extend from about April, 26 A.D. to April, 27 A.D. In this 15th year John the Baptist began to preach repentance all about the Jordan River before Jesus was baptized by him. John's ministry occupied several months in which he prepared the way for Jesus. Notice how this dovetails with the next proof. Proof Six: When Was Pilate Governor? Luke names Pontius Pilate as governor of Judaea when John received his call (Luke 3:1). "Now in the fifteenth year of the government of Tiberius Caesar, Pontius Pilate being governor of Judaea... the Word of God came unto John." Pilate ruled for ten years. Many historians give his dates as 26 to 36 A.D., but this is a mistake. Pilate was deposed a few months before the Passover at the close of his tenth year. He hurriedly sailed for Rome to appeal to Emperor Tiberius. On his way news came that Tiberius died. You will read this in Josephus' Antiquities XVIII, iv, 2. Since Pilate was in a great hurry to reach Rome, he must have left shortly before the death of the Emperor which occurred in March, 37 A. D. Ten years before this is about the beginning of A. D. 27 at which time Pilate began his procuratorship. Here is what the International Standard Bible Encyclopedia says in its article "Pilate": The assumed date for Pilate is usually "from 26 to 36 A. D....Tiberius died on March 16, 37 A. D. Such a delay [in Pilate's journey to Rome] is inconceivable in view of the circumstances; hence...the period of his procuratorship [is] 27-37 A. D."
The New Schaff-Herzog Encyclopedia states, under the article "Pilate": "He probably succeeded Gratus 27 A. D. and ended his procuratorship early in 37; it is not likely that Pilate required more than a year for his return journey to Rome... and he arrived there after Tiberius' death, which took place March 16, 37." Now notice. As Pilate did not begin his governorship till about the commencement of 27 A.D. and as Tiberius' 15th year ended about April of that year, John the Baptist must have begun his ministry in the first few months of 27 A.D.
Jesus, therefore, could not have begun His ministry earlier than the autumn of 27 A.D. Neither could His ministry HAVE BEGUN AFTER THE PASSOVER in the spring of A. D. 28 because the temple was already 46 years in building. Therefore Jesus must have begun to preach in the autumn of A.D. 27. THERE IS NO OTHER DATE THAT WOULD BE CONSISTENT WITH ALL THE PROVABLE FACTS. To find the date of the crucifixion, we now need only find how long the ministry of Jesus lasted. Proof Seven: How Long Was the Ministry? The prophet Daniel foretold that the length of Christ's ministry at His first coming — to confirm the new covenant — would be one half of a prophetic week of seven years. In the midst of that prophetic week He caused the need of sacrifices for sin to cease by offering Himself for the sins of the world. He was "cut off" in the midst of the week, making the ministry at His first coming three and one-half years (Daniel 9:26, 27). "Know therefore and understand, that from the going forth of the commandment to restore and to build Jerusalem unto the Messiah the Prince shall be seven weeks, and threescore and two weeks"-69 prophetic weeks or 483 years in all — "And after threescore and two weeks shall Messiah be cut off, but not for himself... And He shall confirm the covenant with many for a week" — this prophecy is not yet completely fulfilled — why? Because "in the midst of the week He shall cause the sacrifice and the oblation to cease" — He died for the sins of the world in the middle of the week. In a sense this is a dual prophecy. Christ died in the midst of the prophetic week of seven years, after 3 1/2 years of ministry; but He also died in the midst of the week — Wednesday! Now let's turn to the gospels to find the proof that Jesus Christ's ministry was exactly three and one-half years. There would have to be three Passovers during the three years of His ministry, and a fourth on the last day of his earthly life — the crucifixion. The first Passover occurred in A.D. 28 and is recorded in John 2:23. "Now when He was at Jerusalem at the passover, during the feast, many believed in his name." During the following weeks Jesus spent time baptizing in Judaea (John 3:22). "After these things came Jesus and his disciples into the land of Judaea, and there he tarried with them, and baptized." The next note of time is found in John 4:35, which indicates a lapse of time of nearly seven weeks — bringing us to about Pentecost A. D. 28 when Jesus began to preach publicly (Luke 4:16). In Luke 6:1 is the next time reference — "the second sabbath after the first." This is an obscure translation. It comes from the Greek deuteroproton sabbaton which means the "second sabbath of first rank" — the second high day or annual Sabbath — the last day of Unleavened Bread in 29 A. D. (Die Biblische Chronologie by Friedrich Westberg, page 122). And in 29 A. D. that last day fell on a Saturday according to the Sacred Calendar as Matthew 12:14 and Mark 3:6 plainly state. Two Passovers have now occurred. Again in John 6:4 is another Passover which brings us to a Wednesday in the year 30 A. D. "Now the passover, the feast of the Jews, was nigh." This was the third Passover in Jesus' ministry. The fourth and final Passover is recorded by all the gospel writers (John 11:55). "Now the passover of the Jews was near: and many went up to Jerusalem out of the country before the passover, to purify themselves." This last Passover completed a ministry of three and one-half years — from autumn of A.D. 27 to the spring of A.D. WAS CRUCIFIED FELL ON WEDNESDAY. Since Jesus began his 334-year ministry not later than 27 A. D., he could not have been crucified so late as 33 A. D. There was therefore no Passover which occurred on a Friday during his entire ministry! Yes, history proves false the tradition that Jesus was crucified on Friday and rose on Easter Sunday! This question deserves an answer! There is absolute proof from the Calendar Jesus used — proof so simple that anyone can understand — that the Crucifixion was on a Wednesday! Let's understand. Here's the absolute proof from the CALENDAR Jesus used — arithmetic so simple a grade school pupil can understand it! In the first part we gave the often — overlooked proof from the Bible itself that the Hebrew Calendar came from God. There's clear proof that Jesus Himself recognized its authority — proof that the Jews have accurately preserved it to this very day, just as they have accurately preserved for us the Old Testament. The calculations which determine the Hebrew Calendar do not come from the Talmud! You won't find them there! God gave them just as He also gave Israel the Bible. This Hebrew Calendar has continued to be used by God's true Church ever since apostolic times and it is still being faithfully followed today! But the reader's question remains, "HOW can we prove from the Hebrew Calendar by simple arithmetic which day of the week the Passover was in the year 31 A.D. — the year Jesus was crucified?" The answer is astoundingly easy to find. ALL the information you need you can find in the Encyclopaedia Britannica and the Jewish Encyclopedia in the articles on the "Calendar." First, in order to know on which day of the week the Passover occurred in 31 A.D., the year of the Crucifixion, all you need to do is find on which day of the week the Passover occurred in 1931 A.D., for example. Then calculate backward 1900 years to 31 A.D. That ought not be difficult! But before we can — do this we need to understand a few basic differences between the Roman Calendar everybody uses today and the Hebrew Calendar which God gave to His people. Each day according to the Hebrew Calendar — God's Calendar — has 24 hours. God is therefore the author of a 24-hour day! According to the Hebrew Calendar seven days constitute one week. God is the author of the week, too! 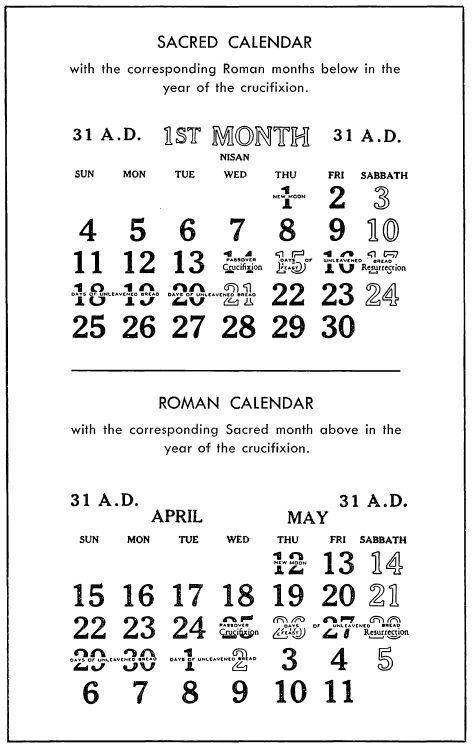 But the lengths of the months according to the Roman Calendar are not the same as in God's Calendar. Roman months, except for February, have either 30 or 31 days. But according to God's Calendar, months have either 29 or 30 days. You see, God determines the months according to the moon. The Romans didn't use the moon to begin the months. Every month of God's Calendar begins about the time of the new moon when the moon's first faint crescent is visible at sunset in Jerusalem. According to the Roman Calendar a new moon may occur at any time during the month. Most people today probably don't even know when a new moon appears! What's the Average length of a Month? Even though some months according to the Sacred or Hebrew Calendar have 29 days and others 30 days, the AVERAGE length of a month from one new moon to another is equal to 29 days 12 hours 44 minutes and 3 1/3 seconds. You can find this information in the 11th edition of the Encyclopaedia Britannica, article "Calendar." Or go to almost any book on the subject of the Hebrew Calendar. If these figures seem new to you reread this booklet when you've finished. This divinely appointed average length of the month is the mathematical basis of the Sacred Calendar! Don't forget it. Memorize it! Say to yourself that "a sacred month averages 29 days 12 hours 44 minutes and 3 1/3 seconds!" Actually an "hour," according to God's Calendar is not divided into 60 minutes or into 3600 seconds. The ancient Babylonians originated this idea. God originally divided the hour into 1080 "parts." Since there are 1080 "parts" in an hour, then a part is equivalent to 3 1/3 seconds. It does not really matter whether you say an hour has 3600 "seconds" or 1080 "parts." Or whether you say a month averages "29 days 12 hours 44 minutes and 3 1/3 seconds" or "29 days 12 hours and 793 parts." This latter is the way the latest edition of the Britannica records it. Jews would write it this way also. Since most of you are familiar with minutes and seconds, we shall write in abbreviated form for simplicity that, FOR RELIGIOUS PURPOSES, a month according to the Hebrew Calendar averages 29d 12h 44m and 3 1/3s from one new moon to another. But this is not the only difference between the Hebrew Calendar and the Roman Calendar. Everyone knows that there are always 12 months in each Roman year. Not so according to the Sacred Calendar! God ordained that there should be sometimes 12 and sometimes 13 months in each year! This is due to the fact that there are sometimes 12 and sometimes 13 new moons in a year between one spring equinox and the next spring equinox. The spring equinox, remember, is that moment when the sun rises due east and sets due west. The spring equinox marks the beginning of a new solar year. Every fourth solar year the Romans called a leap year, when they added a 29th day to February. The Hebrew Calendar has an altogether different cycle! God ordained that His Calendar, which He gave to the Hebrews, should run on a 19-year cycle — not a 4-year cycle like the Romans had. The 19-year cycle has amazing prophetic significance which we cannot discuss now! But let's understand why the Sacred Calendar has a 19-year cycle. A year according to God's Calendar is determined by both sun and moon. It is a solar-lunar calendar, in which there are sometimes 12 and sometimes 13 months. The ancient Romans, however, forgot about the new moons. They used only the sun to determine the year's length. Their calendar, which the world still uses today, is only a solar calendar. Although the average solar year according to the Julian Calendar of the Romans is 365 1/4 days long, the average 12-month solar-lunar year according to God's calendar is about 11 days shorter! That is why God ordained that a 13th month needs to be added to some years! Because 12 months from one new moon to another is this much shorter than a solar year, God ordained that 7 times in a 19-year cycle a 13th month should be added! We already know the average length of a 12-month year according to the Sacred Calendar. Now we can find the length of a 13-month year by merely adding another month of 29d 12h 44m 31/3s! The total average length of a 13-month year becomes 383 days 21 hours 32 minutes and 43 1/3 seconds! There is just one more difference between Roman and Sacred calendars which we need to know before beginning our Passover calculation. How Many Days in a 19-Year Cycle? How many days are there in 19 years according to the Julian Calendar in use among the Romans in Christ's time? Since each year averaged 365 1/4 days, just multiply this figure by 19 and you have the answer. So 19 X 365 1/4 = 6939 days and 18 hours. That's how many days and hours in 19 average Julian years. But now we need to know how many days there are in a 19-year cycle according to God's Calendar. Remember that there are 235 months in every 19-year cycle. Since each month averages 29d 12h 44m 3 1/3s long, all you need to do is multiply the average length of a month by 235. And the answer? 6939 days 16 hours 33 minutes and 3 1/3 seconds. The 11th edition of the Britannica gives this very answer in the article "Calendar," page l000! Verify it yourself. This figure is the average length of a 19-year cycle. Notice that the length of 19 Julian years is slightly longer than the same number of years according to God's Calendar. Both have the same number of whole days, but not the same number of hours. Now we want to find how much longer the Julian Calendar is than the Hebrew Calendar in 19 years. Just subtract the length of one from the other! So the Julian Calendar is 1 hour, 26 minutes and 56 2/3 seconds longer than a 19-year cycle. This answer will make it exceedingly simple in determining the Passover date in 31 A.D. If we can determine when the Passover was in 1931 A.D., then all we need to do is multiply the length of a 19-year cycle by 100 — since there are exactly 19 centuries between 31 A.D. and 1931. That's simple enough, isn't it? We could commence our calculation anywhere. But as most of you have access to a Public Library, we shall use the 11th edition of the Encyclopaedia Britannica for our starting point. The newer editions of the Britannica fail to include the following information! That's why you ought to use the 11th edition to verify this proof. In the Britannica, article "Calendar," we find that the Jewish scholar Lindo calculated the precise moment of the new moon for October in the year 1845. That year began a 19-year cycle, which makes it easy for us to work from. In the Hebrew Calendar we need to find the moment the new moon of the seventh month of the sacred year occurs. This will usually be in September or October. Once we find the beginning of the seventh month of the sacred year, then it is easy to locate in the first month the Passover. The Passover is always 164 days earlier than the beginning of the seventh month of God's Calendar. According to the calculations preserved by the Jews since the time of Moses, the new moon in the sky which determined the beginning of the seventh month (Tishri) in the year 1845 occurred on "October 1, 15 hours 42 min. 43 1/3 sec. as computed by Lindo...," declares the Britannica. In simple language this means that the precise moment at which that new moon occurred was October 1, 15 hours and 42 minutes and 43 1/3 seconds after the previous evening, which began at 6:00 p.m. For calendar purposes an average day is always considered to begin at 6:00 p.m. But since the Romans and the world today reckon time from midnight to midnight, 15 hours after 6:00 p.m. would be only 9 hours after midnight! As people customarily use the Roman Calendar, we can write our starting point as Wednesday, Oct. 1, 9th hour 42m 43 1/3s. This date (October 1) is according to the modern Gregorian Calendar. The difference between this date and the same date in the Julian Calendar is 12 days. You may remember — if you have read Mr. Armstrong's booklet, Has Time Been Lost? — that Pope Gregory dropped 10 days from the Julian Calendar in 1582. Another day (February 29) was dropped in 1700 and still another February 29 was dropped in 1800. That makes 12 days in all. But the week was not changed — only the numbering of the days was altered. 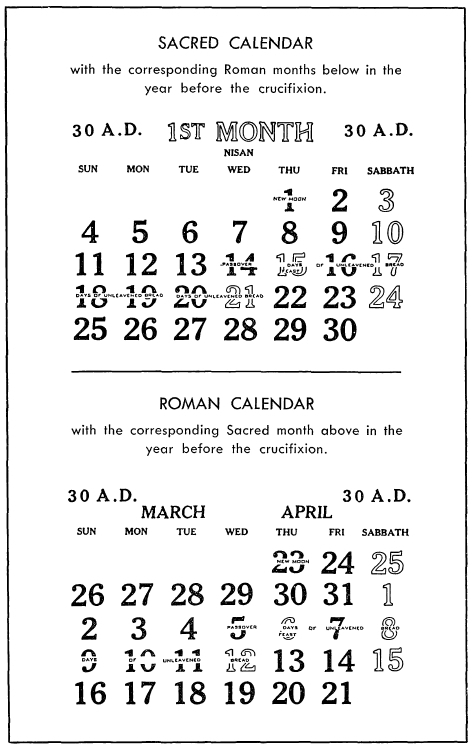 Thus in 1845 the Gregorian Calendar was 12 days ahead of the Julian Calendar which the Romans used in Christ's day. That means that October 1according to the Gregorian Calendar was only September 19 according to the Julian Calendar. That makes the new moon which determined the seventh month in 1845 occur on Wednesday, September 19, Julian dating, doesn't it? Since the Hebrew Calendar is divinely arranged into 19-year cycles, let's jump to 1921 — which is four cycles or 76 years later. (Remember 4 X 19 is 76.) Now we want to find the new moon which determined the seventh month in 1921. Did you notice that it is the same day of the month in 1921 as it was in 1845? That's because 19-year cycles are almost exact lengths of time! So in 1921 the new moon which determined the seventh month of the year occurred on September 19, 3 hours 54 minutes and 56 2/3 seconds after midnight Julian Calendar. But which day according to the Gregorian Calendar, now in use, was this date? Since there was no February 29 in 1900 added, then September 19 was actually October 2 according to the present Roman Calendar. But if we are to find on which day of the week the Passover occurred in 31 A.D., then we need to know which day If the week September 19 (or October 2 according to the Gregorian Calendar) was in 1921. It is simple to find the answer. Since there are an average of 365 1/4 days per year in these '6 years (between 1845 and 1921), just multiply 76 by 3651/4! And the answer is 27,759 days. Divide that by seven and you Lave exactly 3965 weeks and 4 days according to the Julian Calendar. You of course know that any event one week later occurs in the same day of the week. One week from Wednesday, Sepember 19, 1845, is the following Wednesday. Now 3965 weeks later than Wednesday, September 19, 845, is still another Wednesday, but this time in 1921! But we have already found that September 19 was not merely 3965 weeks later, but 3965 weeks and 4 days later! Four days from Wednesday is the next Sunday. So September 19, Julian reckoning (or October 2, Gregorian reckoning) was a Sunday m 1921. You have proved it! If you want to verify it further, read the information in Merriam-Webster's New Collegiate Dictionary, under "perpetual calendar." This is the year we have been waiting for. It is exactly 19 centuries after the Crucifixion. When did the new moon which determines the seventh month occur in 1931? The year 1931 is 10 years later than 1921. How many months according to the Hebrew Calendar elapsed in these ten years? We can find the answer if we know how many of these years had a 13th month added. You will find in the Britannica that a 13th month is added in the following years of a cycle: 3, 6, 8, 11, 14, 17, 19. Since between 1921 and 1931 ten years of the cycle had elapsed, there were only three years with 13 months. These were in the 3rd, 6th and 8th years of the cycle. As all 10 years have 12 months (making 120 months) and there were three extra months added in this period, the total months equals 123. So the seventh new moon of the sacred year in 1931 was 123 months distant from the seventh new moon in 1921. You remember the length of a month? — 29d 12h 44m 3 1/3s. Well, multiply this by 123 and you will have the exact time which has elapsed in 123 months between 1921 and 1931! Plainly the new moon of the seventh month in 1931 occurred 3632 days, 6 hours, 18 minutes and 50 seconds later than in 1921. So the seventh new moon in 1931 occurred on August 30 (Julian Calendar), 10 hours, 13 minutes and 46 2/3 seconds after midnight. But on which day of the week was this? On Which Day of the Week? We have already found that September 19, 1921 (or October 2, by the Gregorian Calendar), was Sunday. Remember that September 19, 1931 (or October 2, Gregorian Calendar), was exactly 3652 days later (365 X 10 + 2). How many weeks was this? Divide by 7 and you will find that 3652 days equals 521 weeks and 5 days. Therefore September 19 Julian Calendar, which was October 2 in Gregorian reckoning now in common use, was five days later in the week than it was in 1921. It was Sunday in 1921. It was therefore Friday in 1931. But on what day of the week did August 30, which was twenty days earlier (and was September 12 by Gregorian reckoning), occur? On Saturday in 1931! Look up any calendar for the year 1931 and see it for yourself! So the seventh month began on Saturday in 1931 — and 164 days earlier, on a Wednesday, the Passover occurred! Now we are ready to find the new moon which determines the seventh month in 31 A.D. And once we have found that, we can locate the Passover on which Jesus was crucified. We must now recall how much the Julian Calendar gains on the Hebrew Calendar in each 19-year cycle. The figure was 1hour, 26 minutes and 56 2/3 seconds. You have already proved that that is how much longer 19 Julian years are than a 19-year cycle of the Sacred Calendar. The year 1931 was the 10th year of a cycle. Hence it did not have a thirteenth month. The year 31 A.D. was also the 10th year of a cycle — because it was exactly 100 cycles earlier! But we find that before 142 A.D., the years in which a thirteenth month was added occurred one year earlier in each cycle. See the Jewish Encyclopedia, article "Calendar," page 500, and Graetz's History of the Jews, Vol. 2, pp. 433, 443-444, regarding the postponement of the leap year. This postponement 42 A.D. was necessary or else the Passover would have occurred too late in the year and would not have been observed in its proper season. Even the Seventh-Day Adventist Comtary recognizes this change in the cycles, though it is unacqainted with the year in which it occurred. Thus in the days of Jesus the years which had 13 months were as follows: 2, 5, 7, 10, 13, 16, 18. Since 31 A.D. was the 10th year of a cycle, it was a leap year with 13 months. That means that the moon which we located on September 5 was the new moon of the sixth month, not the seventh. So the new moon which determined the seventh month in 31 A.D. occurred, according to the Julian Calendar, on October 4, 23 hours, 52 minutes and 16 2/3 seconds after midnight. It is very simple to find on which day of the week this was so long ago. There were 1900 years between 31 A.D. and 1931. Since each year averaged 365 1/4 days, just multiply this figure by 1900! And the answer is 693,975 days between Saturday, August 30 in 1931 and August 30 in 31 A.D.
On which day of the week was this? Divide 693,975 days by 7 and you will have the number of weeks that elapsed! The answer is 99,139 weeks and 2 days. That means that August 30 in 31 A.D. was exactly 99,139 weeks and 2 days earlier than in 1931. It was thus two days earlier in the week! It was Saturday in 1931. August 30 was therefore Thursday in 31 A.D. This would make October 4, the exact time of the conjunction of the seventh new moon, a THURSDAY! So we have now found that the new moon which determined the seventh month of the year in 31 A.D. occurred on a Thursday October 4, 23 hours, 52 minutes and 16 2/3 seconds after the previous midnight. To put it in another way, it occurred Thursday, October 4, 16 2/3 seconds after 11:52 p.m.
One of the rules God gave to the Israelites for determining the calendar is that if the new moon occurs after noon, the first day of the seventh month is postponed to the following day. As the new moon occurred over 11 hours after noon on Thursday, October 4, that day could not be the first day of the seventh month. But another rule of the Sacred Calendar, which God revealed to the Israelites, is that the first day of the seventh month cannot occur on a Friday (see the Jewish Encyclopedia). If it were to occur on a Friday, then the 10th day of the month would occur on a Sunday. The 10th day is an annual Sabbath (Lev. 23:27; Acts 27:9), but as no annual sabbath in the autumn is permitted to occur on Sunday, the beginning of the seventh month cannot therefore occur on Friday. So the first day of the seventh month in 31 A.D. was postponed to a Saturday, October 6, according to the inspired rules of the Hebrew Calendar! In 31 A.D. the sixth month (which has 29 days) began on Friday, September 7. And the fifth month (which has 30 days) on Wednesday, August 8. The fourth month (with 29 days) on Tuesday, July 10. The third month (with 30 days) began on Sunday, June 10. The second (29 days) on Saturday, May 12. And Nisan or Abib, the month in which Jesus was crucified, began on Thursday, April 12, in 31 A.D.
Thursday, April 12, was the first of Abib. Then the Passover — the day on which Jesus was crucified — which is the 14th day of the month, OCCURRED ON WEDNESDAY, APRIL 25, IN 31 A.D. Yes, the divinely inspired Hebrew Calendar proves that the Bible is right after all. The Crucifixion did not occur on a Friday, but on a Wednesday in 31 A.D.! Here is the plain evidence of the Hebrew Calendar. Now reread this booklet for any points you may not have fully grasped upon the first reading. You cannot afford to be without this knowledge!